There simply is no longer any doubt that the gut microbiome is central to the health or disease state of the host. This is no longer a concept or hypothesis discussed amongst functional and integrative practitioners, but has now become amongst the hottest area of conventional medical research. However, with all of these studies coming out daily, do you feel comfortable in leveraging this new information at the point of clinical care? Does this data really affect your clinical and diagnostic decisions or how you treat your patients and clients? This presentation will bring the experience of a leading naturopathic and functional medicine physician who has had inside access and insight into the evolution of gut microbiome testing, research and the development of natural products and to you in a way that will clinically apply this emerging understanding into your practice paradigm. Dr. Brady has 27 years of experience as an integrative practitioner and over 23 years in health sciences academia. He is a licensed naturopathic medical physician in Connecticut and Vermont, is board certified in functional medicine and clinical nutrition, and completed his initial clinical training as a doctor of chiropractic. Dr. Brady has been the chief medical officer of DFH for over 16 years and has been a guiding presence in product formulation and design, clinical education and support, quality control oversight and strategic partnerships for the company. 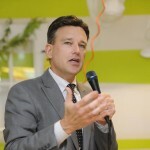 He also currently serves as the chief medical officer for Diagnostic Solutions Labs, and is the vice president for health sciences, director of the Human Nutrition Institute, and associate professor of clinical sciences at the University of Bridgeport in Connecticut. He has appeared on the plenary speaking panel of some of the largest and most prestigious conferences in the field including; IFM, ACAM, A4M, ACN, IHS, AANP and many more. He is in clinical practice at Whole Body Medicine in Fairfield, CT, specializing in functional, nutritional and metabolic medicine.